At least according to this Japanese poll. Well, that particular opening is pretty cool. Lots of really fun, stylish moments. The puppets are great, you got the lipstick bullet, and I always love seeing Lupin dressed like his grandfather. However, I think the image that stands out the most to me is Goemon in the oni mask. It tells you everything you need to know about him, albeit in a subtle way. That said, though...I feel that the second opening got robbed. It's composed entirely of great shots with a stylized/psychedelic/abstract bent (that bit of Zenigata running inside of Lupin's Walther...gorgeous!). The split-screens into comic book panels are not only a reminder of where the franchise started, but just look really cool, in a Roy Lichtenstein kinda way (but without the whole "be a jerk and making money off plagiarism" thing). And there's a few moments of humor in there, like Pops running upstairs, only for Lupin and the gang to go past him in an elevator. And that's not even getting into the music itself. It's probably the first variation on the theme song, even though it's pretty much limited to just adding lyrics. But it works. Man, I love that opening. 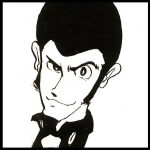 I know that is not the Lupin III opening that most fans consider as "classic, but Lupin III '80 opening is my personal favorite.